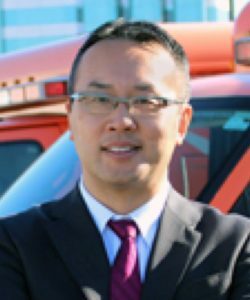 Dr. Tien joined Ornge as the Chief Medical Officer in 2015 from Toronto’s Sunnybrook Health Sciences Centre where he was the Medical Director for the Tory Regional Trauma Centre, Canada’s largest trauma centre. Previously he was a Colonel in the Canadian Armed Forces, having served with both conventional and Special Operations Forces in Afghanistan, the former Yugoslavia, the Golan Heights and Myanmar. Dr. Tien has had a distinguished career as a frontline military physician who has worked in combat zones, a well-regarded mentor within the Forces, a researcher in the field of trauma surgery, and as an educator at the University of Toronto. His accolades include the Order of Military Merit, the Queen’s Diamond Jubilee Medal and the Major Frederick Banting Chair in Military Trauma Research.